Is Ducati Preparing a New Aerodynamic Fairing? Ducati has made two consecutive victories in MotoGP. 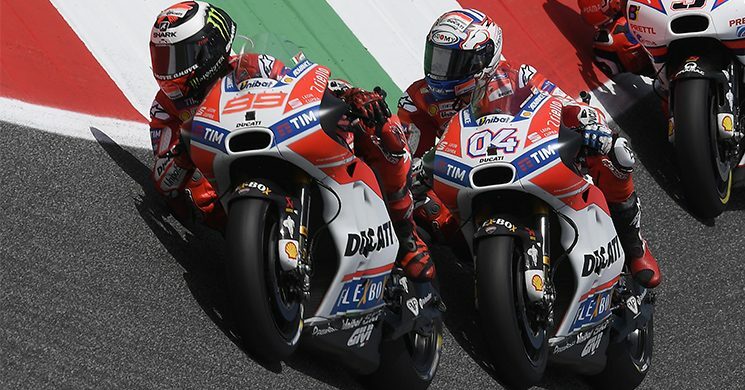 Andrea Dovizioso prevailed on the asphalt of Mugello and Barcelona to reach a mark that no runner of Borgo Panigale had achieved since Casey Stoner in 2010 and, with these results, ‘Dovi’ has submitted his bid for the title. However, the rider and Gigi Dall’Igna, CEO of Ducati Corse, just want to think about Assen. “I’m thinking of how to get the best possible result, how to get the best conditions for our two riders,” admits the Italian engineer in an interview with The Gazzetta dello Sport. The factory of Bologna presented in the last test of preseason its famous fairing Hammerhead (read more) to replace the ailerons, but they have not homologated it and, therefore, they have opportunity to introduce a new one in the remaining Grand Prixes. At the moment, the manufacturers that have used the aerodynamic fairing are the Yamaha, KTM, Suzuki and Aprilia. In case of winning, the celebration of Gigi is clear: “I will uncork the fourth consecutive bottle”. At the moment, Dovizioso is second in the MotoGP general with 7 points behind the leader, Maverick Viñales. Lorenzo is seventh to six points behind Johann Zarco.